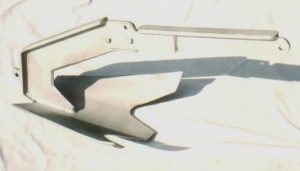 The Super MAX Anchor is manufactured from steel made in the USA. The flukes and shanks, are made from the strongest steel in the anchor industry, American Society for Testing Materials (ASTM) A514 high yield/high tensile strength steel. Not all anchor manufacturers use the highest tensile strength steel. A quote from Mantus (website): “All shanks are HT ASTM 514 Steel and Flukes are mild steel A36 equivalent.” The predictor of steel bending to the point where the steel will not return to its original position is referred to as “Yield.” The A514 steel has yield measured at 100,000 psi and A36 steel has yield measure at 36,000 psi. There can be tremendous strain on a fluke to bend when lodged against an object in the seabed. Super MAX anchor flukes, made from A514 steel, maximize resistance to bending under these conditions. A514 steel is more expensive than A36 steel. We proudly share where our anchors are made and who makes our anchor. As mentioned above, we use USA made steel and guarantee its quality. Our welders and fabricators are local and we are proud to say, “made in the USA.” On a recent trip to a major boat show, two well-known anchor manufacturer vendors reluctantly shared their anchors were made “off shore.” When pressed, the two manufacturers quietly revealed the manufacturing countries. We invite the public to come to our production facility, observe the manufacturing process, and speak to our production staff. The Super MAX Anchor has a lifetime warranty for original owners for new purchases. The Super MAX Anchor has the largest surface area of any anchor of comparable size. Example, the Super MAX 20 anchor (73 lbs) has a fluke area of 380 square inches. 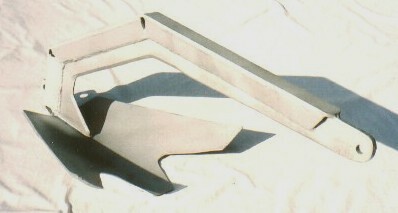 The Rocna 33 anchor (73 lbs) has a fluke area of 263 square inches. The larger the fluke area on a properly set anchor with a flat or concave design, the better the hold. With the largest fluke, strong A514 steel, and the adjustable arm Super MAX design, a captain has unequaled holding angle in the seabed substrate. Anchors must be set properly to withstand tremendous strain and hold the vessel firm in adverse conditions. The Super MAX Anchor, with the largest concave fluke in the industry, has a well-deserved reputation of being easy to set. We have identified a process to follow when setting a Super MAX anchor that may be different from other anchor setting procedures. We work with new owners on the recommended process. We are constantly researching improvements in the process for setting the Super MAX Anchor. Since purchasing the Super MAX manufacturing in spring of 2015, minor design changes have been made based on the recommendations of a steel engineer. These changes increased the size of certain steel components (thickness and width) to better withstand the strain in extreme anchoring conditions. The Super MAX anchor is now even stronger. We are very confident in our lifetime warranty. After extended use and wear, an anchor and possibly a chain need to be re-galvanized. This can be quite expensive because galvanizing companies require a minimum weight charge. This weight requirement is greater than the weight of a single anchor and chain. As a Super MAX Anchor owner, you can bring us your anchor and we will inspect your anchor thoroughly and include your anchor and chain with our regular anchor galvanizing. The customer receives our reduced galvanizing price. The savings on one re-galvanizing process may account for the difference in the original cost of a Super MAX anchor and a competitive anchor. The Super MAX anchor is built to be the last anchor you will buy. You are a customer for life and we will treat you and your anchor that way. Considering all factors, the Super MAX anchor is a long-term value for you and your vessel. *Our newest addition to the Super MAX Anchor family is the Super MAX 9 which can be used as stern anchor or for small boats up to 3,000 pounds. Weighing only 7 pounds, you can use it to hold your boat off a windward pier by throwing it out to windward. With a scope of 2.5 to 1, it will grab and hold your boat away from the pier. It sells for only $99.